The world has a waste problem. This is known by virtually everyone on the planet, but hardly anyone cares to look at the exact figures and to face the reality of what is coming in terms of the condition of our home: Earth. In order to highlight how much waste us humans produce, the following paragraphs will be written in detail. First, let us start with the yearly count. According to The World Counts, “Every year we dump a massive 2.12 billion tons of waste. If all this waste was put on trucks they would go around the world 24 times” (“Tons of Waste Dumped – Globally, This Year”). Not only is this amount unprecedented and is only getting worse every year due to population growth, the majority of countries are not dealing with waste properly. For instance, the United States is known for producing the largest amount of garbage in the world. “The U.S. consumes 30 percent of the world’s resources despite making up only 5 percent of the world’s population. It also produces 30 percent of the world’s waste. In only a year, Americans throw away around 26,800,000 tons of food, 8,550,000 tons of furniture and furnishings, 6,330,000 tons of clothing and footwear, and tons of other waste” (“Top 10 Countries that Produce the Most Waste”). Therefore, it can be said that the United States is the main problem-country to regulate in terms of waste production. Another disturbing note is that 99 percent of the materials we purchase our thrown away within six months (“Tons of Waste Dumped – Globally, This Year”). This is caused by the capitalist idea of wanting to always have something new and fashionable, instead of something old. Also, producers of materials sometimes make sure that products do not last long. This phenomenon is called planned obsolescence (The Economist). With this much being thrown away and at such a rapid rate, the future looks dim. 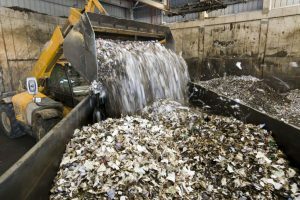 The World Bank reports that, “Without urgent action, global waste will increase by 70 percent on current levels by 2050, according to the World Bank’s new What a Waste 2.0: A Global Snapshot of Solid Waste Management to 2050 report” (World Bank). This is important to take in, as all this waste harms human health, natural environments, and speeds up climate change. The poorest nations, unfortunately will be hit the hardest by the increasing amount of garbage due to their lack of proper waste management systems, population growth, and uninformed populace about how to handle waste. Looking farther into the future, when will be the peak of our waste? In other words, when will waste production be so high, that its effects will be irreversible? Around the year 2100, the peak of our waste production is estimated to come. By this time, the world will be covered in trash, with no more space for landfills, and the burning of waste either being too harmful for the environment or not enough to combat the exponential growth of garbage (Stromberg, Joseph). All that trash will not only be unsightly, but also harmful to humans, animals, and plants. Plastics and other materials are ingested by animals, and the chemicals these materials contain can easily get inside our bodies, and affect our hormones and overall health. In addition, the spread of garbage hinders plant growth (“How Our Trash Affects the Whole Planet”). Waste management is more pertinent than ever. By 2050, the exponential production of trash will result in a 70% increase of waste. Furthermore, by 2100, the world will be so covered in trash, that it will be a common sight wherever we go. Governments and organizations have to curtail this increase, or else Earth will be swallowed by human garbage, and disease, death, and a lack of living space will come as if a nightmare. “Tons of Waste Dumped – Globally, This Year.” The World Counts, www.theworldcounts.com/counters/shocking_environmental_facts_and_statistics/world_waste_facts. “Top 10 Countries that Produce the Most Waste – IILyear4.” Google Sites, sites.google.com/site/iilyear4/top-10-countries-that-produce-the-most-waste. “Planned Obsolescence.” The Economist, The Economist Newspaper, 23 Mar. 2009, www.economist.com/news/2009/03/23/planned-obsolescence. “Global Waste to Grow by 70 Percent by 2050 Unless Urgent Action Is Taken: World Bank Report.” World Bank, www.worldbank.org/en/news/press-release/2018/09/20/global-waste-to-grow-by-70-percent-by-2050-unless-urgent-action-is-taken-world-bank-report. Stromberg, Joseph. “When Will We Hit Peak Garbage?” Smithsonian.com, Smithsonian Institution, 30 Oct. 2013, www.smithsonianmag.com/science-nature/when-will-we-hit-peak-garbage-7074398/. “How Our Trash Affects the Whole Planet.” Green Living Ideas, 24 Mar. 2016, greenlivingideas.com/2015/04/24/how-our-trash-affects-the-whole-planet/.